Prices are lower than they've been since 2010 - You read that correctly. Silver prices haven't been this low in about four years. Are silver prices poised to go lower? Silver has bounced between $18 and $23 since summer 2013. Of course, fluctuations in the market could cause prices to further soften, but they could also rise. Why take the chance? The U.S. Mint hasn't put restrictions on American silver eagles... 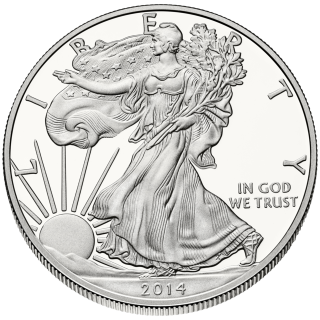 Yet - The U.S. Mint sold more than 1 million American silver eagles on October 1, 2014. While the U.S. government claims to have enough silver on hand to meet current demands, supplies may not last if the U.S. Mint has another few blowout sales sessions. If the U.S. Mint does cap American silver eagle orders, expect marked premiums on older silver eagles that you can now buy for only a nominal price over spot. There are plenty of cheap silver coins available - Because some investors sold off their silver coins when bullion prices fell during summer 2013, there is a glut of old silver coins available now at coin dealers across the United States, and tons are available at silver dealers and on eBay. Don't take this scenario for granted. Again, if the U.S. Mint restricts sales of American silver eagles, bullion investors will buy silver coins from existing supplies, potentially pushing prices up and making it harder to find bulk rolls and bags of silver coinage. Again, these are my three reasons I'd suggest you to buy silver coins. I don't have a crystal ball, so please take my advice but weigh it in consideration of your personal circumstances and financial situation. You may have unique personal reasons to buy silver coins at this time. Or, you might decide to wait out the rest of 2014 and see where the economy is heading as we go into the first quarter of 2015. Whether or not you buy silver coins or jump into other areas of bullion investing, you may still be interested in following the daily metals price changes that are certainly keeping many investors on their collective toes.